Good Morning to one and all present over here, today I am going to speak few words about “Excuses of not doing homework”. Homework has been nightmare for students of all ages. Homework means the extra work given by teachers to be done at home. Homework has some positive as well as some negative aspects. I as a child hated homework. I was always busy searching for excuses of not doing homework. Since I studied in a catholic school strictness was on its extreme. Incomplete homework came with a penalty or a punishment. As a child I saw no point in doing homework or any usefulness. What is the point of doing something at home? Will it be extra good? Just like a cherry on top of a cake. To make matters more interesting we were awarded daily marks for our regular homework. I tried different means to avoid doing homework. Some worked out well some didn’t. There are a few instances which will relate and which will help to understand the extreme tricks that I pulled off. I once tried to bribe my elder brother with a box of chocolates. In return I asked him to do for me a page of the math homework which we were assigned. He instantly agreed. I was a pull student of math. Almost regularly maximum of my math homework sums got crossed off. On the other hand, my elder brother was a brilliant student. My parents always used to give me his example. So, the next day I went happily to school with the homework that he had done for me. For the first time in my life all the sums were correct. My teacher was impressed. She praised me for my improvement over a night. So, I extended my plans for another day. I asked him to do it again. He did again and all my sums were correct. On the third day the teacher got suspicious. She took a surprise test on the fourth day. To my utter horror she had given the exact sums that she had given for homework. The rest of my batch mates could solve it easily because they had practiced it, but I was seeing those sums for the first time in my life. Solving them would be a far fetched business. Hence, I scored very poorly in that exam. The teacher understood. She called for my brother in front of the principal and my brother confessed everything. My parents were called and I got a bad scolding at home. Later everyone had a good laugh thinking about the excellent plan which I had devised. In another occasion I acted I was terribly sick so that I could avoid the burden of doing homework. The next day when I went to school I was asked to submit a doctor’s certificate confirming that I was sick. Well that was another setback. I told my parents and got a lot of scolding in return. I also had to write an apology letter seeking forgiveness. In other events I sometimes used to write rubbish and take it to school in order to show that I have really done some work. But if you see it you’ll understand that its pure nonsense written all over the copy. I think many other students have also devised many other ways to elude this situation of not doing homework. In college days we come across another method of postponing built up homework and it is known as ‘bunk’ or ‘mass-bunk’. In this case all the students of the same class agree not to go for classes altogether or all of them submit later. This sort of action is also another excuse of not doing homework. No classes mean no burden of homework. This also influences the overall growth and development of the academic studies. 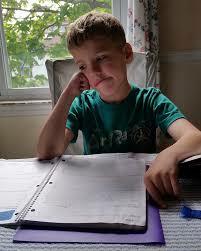 Homework’s help us to keep in pace with the regular progress of studies. It helps us to learn regularly helps to keep us updated. But regular homework forms a burden on the students. Students don’t find adequate time to complete their homework’s and also their own time to study their regular studies. Also, nowadays students have their tuition’s and private tutors. Students find it difficult to divide their time between their personal studies and their school studies and their homework’s. Homework’s are important when it comes to academic learning. It helps us to remember the lessons taught in class an also keeps us under regular practice. But in my opinion the process of giving homework should be made more interactive. Such that it doesn’t become a burden on little shoulders. It should be such that students would take interest in doing. Students should ask for homework themselves rather than the teacher dumping it on them. Mind blogging games, quizzes, puzzles, math’s tricks are things that should be incorporated in the daily monotonous routine of homework. Also making use of modern technology homework’s can nowadays be supplied online by using small interesting videos and asking questions related to that, the answers to be submitted online. All this change all together will help to remove the fear about homework’s I presume.